Earlier this year, a member of KarateForums.com reached 25,000 posts on the community. The member, Brian Walker, is also a member of my staff, and I recently interviewed him for a feature on law enforcement officers who are also moderators. When he hit the mark, we posted an announcement and various members congratulated him and talked about how much he’s added to the community. But I decided that I wanted to do more, to recognize Brian’s outstanding contribution to our community. I started a private forum thread that all staff members, except Brian, had access to. I used this thread to ask for ideas as to how we could honor Brian. There were a few different ideas, but the most intriguing one was about Brian’s appreciation for medieval armor and weaponry. I didn’t realize he had a passion for it, but the person who suggested it (Bob) brought up the idea of sending Brian a sword. After some more discussion amongst the staff, and some research into available options and the cost, I decided to go with it. 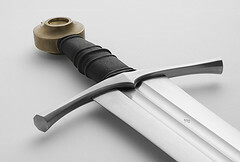 Sending a sword would be a cool, unique gift, and I was comfortable with the cost. It took us awhile to order it because we put together a video presentation (embedded below) including other members of the community. Alex, another member of the staff, volunteered to record a video, as did the others that were included. I didn’t even suggest it. As you can see, it came out beautifully. The day that the sword arrived, I received a notification on Facebook. It was from Brian, tagging me and some other members, as well as the community page on Facebook, talking about how he was surprised, appreciative, etc. It was a really great post to read, and once I knew that he had received it, I immediately posted this announcement and pushed the video presentation online. It couldn’t have gone better. The point was to show Brian how much we appreciate him and, reading his responses, we did that. My Online Community is Struggling with Member Self-Promotion: What Can I Do?